World War I: "Xmas To Be Day Big In U. S. Hospitals"
Christmas in army hospitals will be a happy day for sick and wounded patients. A special Christmas dinner will be served and there will be other evidence of good in the form of decorations of winter greens, and in a number of cases there will be Christmas trees and special programs. Relatives and friends of the patients will not forget them in the matter of gifts. Every opportunity will be grasped in order to make the Christmas season this year as joyous and cheerful to the brave wounded men as it is possible to do. 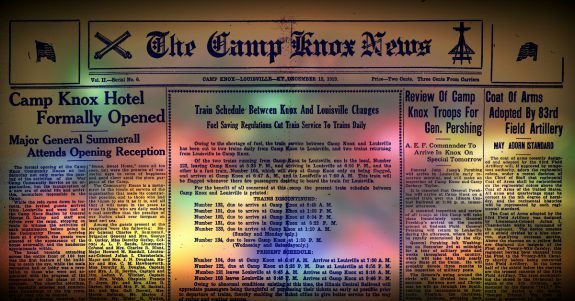 Our collection, America and World War I: American Military Camp Newspapers, addresses a topic and period that continues to be of the widest interest and importance to scholars, students, and the general public – America in the World War I Era. Camp newspapers make important original source material—much of it written by soldiers for soldiers—readily available for research. At General Hospital No. 20, Whipple Harracks, Arizona, a Christmas tree will be provided for the patients at the Red Cross house on Christmas Eve. Christmas carols will be sung by the nurses and reconstruction aides in all the wards on Christmas morning. Local talent is arranging to entertain the patients at a good vaudeville show at the hospital, and a movie program for Christfas week is being arranged by the Red Cross. On Christmas day a party and dinner is being planned, to be attended by all patients and those on duty at the hospital. Elaborate plans are under way for special entertainment on Christmas day for the patients at the Army General Hospital, Fort Bayard, N. M. A band is expected from Santa Rita to provide music for the various events. A large Christmas tree will be placed on the parade ground if the weather permits or in the Red Cross House if the weather is inclement. The Chaplain of the hospital will hold Christmas services in the chapel. Each mess in the post will serve turkey for Christmas dinner. A feature of the plans is that entertainments will be given for all patients who cannot leave their beds, in their respective wards, and a chorus of 25 voices will sing Christmas carols in all the wards. For the personnel of the hospital a Christmas ball will also be held. The Red Cross Christmas program at this hospital will be one of the most elaborate that has ever been undertaken in any camp. There will be a Christmas tree with all its trimmings, and presents will be distributed to every patient by the Red Cross. The program will be complete in every way so as to make it seem as near home-like as possible. At the Letterman General Hospital, San Francisco, California, the Red Cross will give a Christmas tree for the patients and the Alameda Post of the American Legion will furnish part of the Christmas entertainment.